Henkel has helped Envases Técnicos Zaragoza S.L. (Entinox), a leading Spanish manufacturer of stainless steel beer barrels (“kegs”), set up an innovative pickling and passivating line using a nitric acid-free Bonderite process. Benefits include superior HSE performance and bath life over traditional mixed acid pickling systems as well as outstanding corrosion resistance. The new keg production plant of Entinox at Zaragoza, Spain, has a capacity for 450,000 barrels per year, made from austenite stainless steel with a surface of 2 square meters per barrel. The challenge in pickling solutions for stainless steel lies in removing all scale, iron contamination and welding oxides for achieving a fully passivated surface with an even, clean and aesthetic finish. In the food industry and for key products such as beer kegs, the surface must also be absolutely free from any traces of pickling agents after the process. In addition, manufacturers face increasingly strict health, safety and environmental (HSE) regulations with regards to the release of potentially harmful substances, such as NOx emissions in air and nitrate effluents in water. Bonderite C-CP 1300 is the latest generation of Henkel’s established nitric acid-free cleaning technologies that were originally developed several years ago. In contrast to common mixed acid pickling systems, which are still used in many stainless steel segments today, it contains no HNO3 (nitric acid), while delivering excellent pickling and passivating results. Furthermore, its absence of citric compounds also addresses the growing concern among beer brewers about residual flavors in the barrels. Bonderite C-CP 1300 can be used in spraying or immersion lines and is suitable for almost any stainless steel grades based on austenite, ferrite, martensite or duplex, including high-chromium AISI/SAE 4XX qualities. The system includes a starter (ST) for bath make-up, two components (R & Z) to maintain the acidity of the bath as well as the oxidizing and passivating capacity of the pickling solution, and an optional accelerator (TO) for use in tough to pickle materials or in applications with limited contact times. 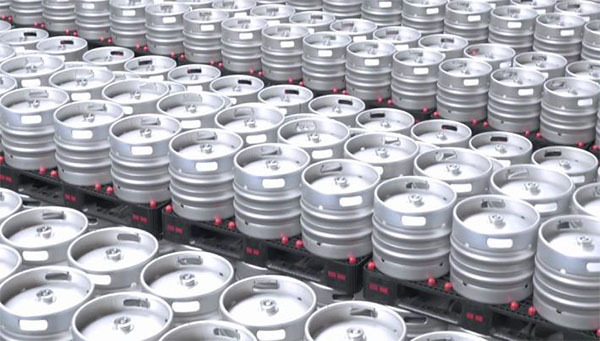 Entinox’s kegs are normally made from 1.4307 (AISI 304L) grade stainless steel sheet, which is one of the most widely used austenitic chromium-nickel steel alloys. After bending, forming and welding, each keg has a surface of 2 square meters. Prior to pickling, the barrels are cleaned and degreased using a Bonderite C-AK product in a spray washer. The Bonderite C-CP 1300 R and Z mix is then applied in another spraying step. The manufacturer’s new Zaragoza plant has a production capacity for up to 450,000 barrels per year and offers kegs in standard sizes of 20 to 50 liters as well as 7.75 and 15.5 U.S. gallons, including various customized options. “The pickling quality and efficiency that we achieve with Henkel’s process is outstanding,” comments Angel Roche, Technical Manager for Entinox. “While the resulting corrosion resistance is on par with that provided by mixed nitric acid-based systems, Bonderite C-CP 1300 provides a significantly longer bath life. Moreover, as a more environmentally friendly nitric acid-free solution, it also eliminates the risk of nitric fumes within the production area. And the absence of hexavalent chromium means that all effluents can be treated in our existing waste water plant.” Apart from kegs for transportation of beer to bars and restaurants, Bonderite C-CP 1300 has a wide potential for leveraging similar cost and environmental benefits in many other markets where stainless steel is processed. Examples span from heat exchangers and chemical process equipment to stainless steel devices and machines in the food and beverages industry as well as in the pharma and semiconductor segments. Bonderite is a registered trademark of Henkel and/or its affiliates in Germany and elsewhere. Henkel operates globally with a well-balanced and diversified portfolio. The company holds leading positions with its three business units in both industrial and consumer businesses thanks to strong brands, innovations and technologies. Henkel Adhesive Technologies is the global leader in the adhesives market – across all industry segments worldwide. In its Laundry & Home Care and Beauty Care businesses, Henkel holds leading positions in many markets and categories around the world. Founded in 1876, Henkel looks back on more than 140 years of success. In 2017, Henkel reported sales of 20 billion euros and adjusted operating profit of around 3.5 billion euros. Combined sales of the respective top brands of the three business units – Loctite, Schwarzkopf and Persil – amounted to 6.4 billion euros. Henkel employs more than 53,000 people globally – a passionate and highly diverse team, united by a strong company culture, a common purpose to create sustainable value, and shared values. As a recognized leader in sustainability, Henkel holds top positions in many international indices and rankings. Henkel’s preferred shares are listed in the German stock index DAX. For more information, please visit www.henkel.com. Envases Técnicos Zaragoza S.L. (Entinox), with headquarters at Figueruelas (Zaragoza, Spain) was founded in 2014 and has established itself as a world leading manufacturer of stainless steel food, beverage and chemical containers. Among the company’s most notable inventions, its stainless steel butane bottle has revolutionized the distribution and logistics of the butane gas industry. Entinox’s advanced beer kegs are valued by breweries throughout Europe, the Americas, Asia and Africa. Its container production is fully certified to ISO 9001 and 14001 and uses state-of-the-art technology to maintain the highest standards of quality, safety and sustainability. For more information, please visit www.entinox.es.